Our Friendship Day Event is inspired by the lifelong friendship between Debra and her best friend Gina. Debra and Gina met in middle school and became fast and fabulous friends. They remained close through the years and distances, with Debra on the west coast and Gina on the east coast. When Gina was diagnosed with cancer, Debra made Gina a bright, beautiful friendship quilt to lift her spirits and show her support and love. Gina bravely battled with cancer for two years. During that time Debra continued to make many more quilts to cheer Gina's fellow patients in treatment and in gratitude to the doctors and nurses that cared for Gina. Sadly, Gina lost her battle with cancer. Debra profoundly felt the loss of her best friend, but with positivity and grace she continued to make quilts for cancer patients and processed her grief. 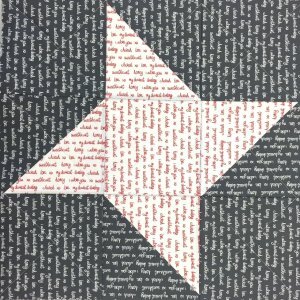 She approached us with the idea for Friendship Day to honor our friendships and our love of quilting. Saturday, April 7th is Gina's birthday and it is the perfect day to celebrate the bonds of friendship. Debra will be teaching two Friendship Star Block classes. The Friendship Star Block uses the nickel raw edge technique. All the materials for class will be supplied. The blocks made in class will be collected and made into a donation quilt for Harvest Home. Harvest Home's mission is to transform the lives of homeless pregnant women and their children by providing housing, support, and programs that equip women to become great mothers. 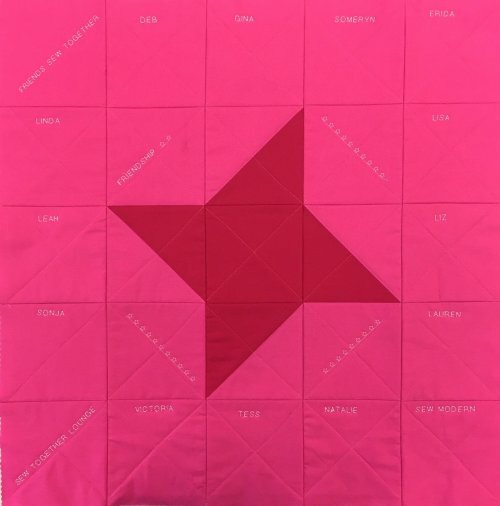 From the class you will leave with the block pattern and knowledge of how to make the Friendship Star Block. In addition, you will get instructions for a super cool tote bag featuring the Friendship Star block. 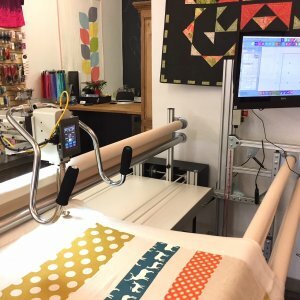 Sew Together has just added edge-to-edge long arm quilting to our list of services. Our new Innova quilting machine arrived via the Easter Bunny last Sunday. Come and meet our newest addition and help us name her!!! Drop your idea for the perfect name into the bowl for consideration for a chance to win an edge-to-edge quilting service for one throw size (60" x 60") quilt. Grab one of your besties and come by the shop. Sign up for one of the free classes. There will be tasty treats. Enter a name idea for our new longarm to win an edge-to-edge longarm quilting service for a throw size quilt. Enter a drawing for you and your friend to win some cool swag! Looking forward to seeing all our friends and sewing together this Saturday, April 7th.